Textiles are used for many different purposes in medicine and therefore must satisfy a wide range of requirements. Examples include first aid material, backing material for bandages, wound dressings and cloth slings. For all such materials, hygiene and quality are critically important. The requirements for textile attributes vary widely depending on the application. 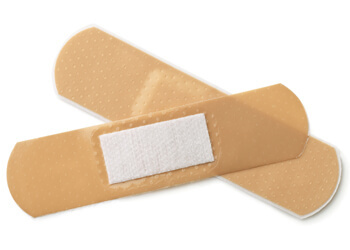 Bandage materials must be flexible and tear-resistant, and plasters can be elastic or inelastic. Coatings are applied in manufacturing, and there are various drying processes, some of which require a protective atmosphere. All of these processes place high demands on air technology, which controls the composition of the gases, air amounts and air distribution. Our LTG fans are as versatile as the tasks that medical textiles must perform. As textile processors you too can benefit from our filter technology. Our filters reliably extract dust and fibres, and they separate the material for disposal or reuse. Our engineering services will help you design your air system, comply with emission limits and control production parameters like temperature and humidity. To ensure maximum reliability, we can carry out preliminary tests at our technical centre or right at your location. LTG Filtration Technology products have proved their worth in the medical industry over many years. Our product range has a modular structure, allowing you to adapt all of the process stages to your application. Depending on the design, a number of filter stages can be involved. For example, these systems can be equipped with a TVM pre-filter unit and a fine filter like the CompactDrum Filter®. Reusable filtered materials are conveyed to the respective secondary circuits, where they are efficiently separated by our ZSA/ZSB/ZSC centrifugal separators, FKA/FKC fibre compactors or CPS compacting power screws. Our product portfolio also includes fans in all designs and sizes for conveying air. We offer LTG fans in all flow configurations and so we can give you the best possible advice. For example, our portfolio includes highly efficient LTG axial-flow fans and high-quality LTG centrifugal fans, which are mainly used for conveying primary air. Our conveying fans in the M./5 RU..MS series were specially developed for handling concentrations of dust and fibres in the secondary circuits of filter systems. By selecting special, highly wear-resistant material pairings, we have made them very durable and minimised the maintenance requirements. We also offer LTG tangential fans, which distribute air very evenly over large areas. This makes them particularly advantageous for drying in conveyor systems or throughput processes. Our engineering services are available if you need help in designing air systems, complying with emission limits or controlling production parameters like temperature and humidity. We can validate your application by means of tests in our technical centre, and will also be glad to provide our mobile filter chamber for preliminary testing in a realistic installation situation. We cooperate with major manufacturers of plasters, bandage materials, cloths, wound dressings and tamponades, and have gathered decades of experience in medical and laboratory Technology.